It has been almost ten years since George Morrison (1919-2000) died. Thus, seeing eight of his paintings on view at the Bockley Gallery, all culled from the collection of the Minnesota Museum of American Art (MMAA), was like embracing a dear old friend. Artist. Ojibwe. (Although George preferred the name Chippewa.) Teacher. Minnesota native. Husband. Father. Friend. He was all of these things, and more, to many people. The overflow crowd who attended the exhibition opening on a recent Sunday afternoon proved it. This discreet exhibition—which will be on display through February 20—is a teaser, an announcement of greater things to come. Happily the MMAA, whose holdings of Morrison’s paintings, drawings, prints and sculpture number 74, is organizing a future exhibition of his work. Tactile abstract landscapes. The signature horizon line. Vibrant, saturated color. Expressive brush stroke. Dense texture. The work on display at the Bockley brings back George’s spirit with velocity. At the opening reception, MMAA director Kristin Makholm, along with co-curator W. Jackson Rushing III, Carver Chair of Native American Art at the University of Oklahoma, delivered remarks. Makholm explained the museum’s plan to tour the show, with the assistance of Arts Midwest, so as to bring Morrison’s powerful vision to a national audience. Morrison’s last major exhibition the MMAA’s 1990 Standing in the Northern Lights: George Morrison, A Retrospective, seems like it happened a long time ago. Too long. Standing In the Northern Lights, or Wah Wah Teh Go Nay Ga Bo, was Morrison’s Indian name. 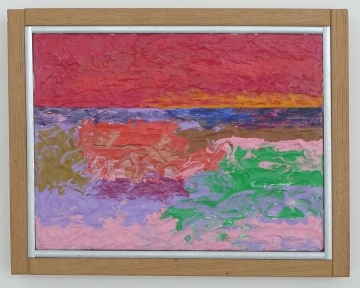 An exhibition of his small horizon paintings, Morrison’s Horizon, opened late in 1998 at the Minneapolis Institute of Arts and Bockley has shown a number of Morrison’s pieces over the years. Morrison broke the mold of what previously was characterized as Indian art: figurative, stylized, depicting “Indian” subjects like animals, flowers, and tribal symbols. As Morrison often said, he was not an “Indian artist” but rather an artist who happened to be Indian. What made George’s practice unique and influential to younger artists? Simply, his expansive life. A member of the Grand Portage Indian Reservation, Morrison showed considerable artistic talent as a youth. After graduating from Grand Marais High School in 1938 he attended the Minneapolis School of Art (now the Minneapolis College of Art and Design) and graduated in 1943 with a scholarship to study at the Art Students League in New York City. Influenced by surrealism and the nascent abstract expressionist movement, Morrison began to show his work in New York galleries and even at the Whitney Museum of American Art. In 1952 he was awarded a Fulbright Scholarship to study at the École des Beaux-Art in Paris, and the Université de Aix-Marseilles, Aix-en-Provence. Although they never met, he and Picasso both worked in Aix at the same time. After spending a year in Duluth, Morrison returned to New York in 1954 and came to know such abstract expressionist giants as Franz Kline, Jackson Pollock, and Willem de Kooning, joining them at the legendary Cedar Bar. He later taught in Minneapolis, Duluth, Dayton, Ohio, Ithaca (Cornell University), Pennsylvania (Penn State), and New York City, before accepting an assistant professorship in 1963 at the prestigious Rhode Island School of Design (RISD). At this time he discovered Cape Cod and reconnected with the sea and the horizon line. Morrison taught at RISD until 1970, when he returned to Minneapolis to teach art and American Indian studies at the University of Minnesota. He retired in 1983. He lived in a renovated church in Saint Paul with his wife, artist Hazel Belvo, and son Briand. In the mid- 1970s, they acquired land near Grand Portage on Lake Superior, which they named Red Rock for the local jasper and George’s rock on the Indian Medicine Wheel. Red Rock was soon to become both home and studio for the artists, and where George spent much of his time living and working after retiring. In 1991 he and Belvo divorced, but remained friends. Although he faced several life-threatening illnesses, he never quit working, making his horizon paintings, prints and drawings until the end. In April 2000, George passed away at Red Rock. In 1990, I wrote a long review of Standing in the Northern Lights that was published in Arts Magazine. George sent a handwritten note thanking me, saying that it was the first time his work had been reviewed in a New York publication. We went from being art-world colleagues to friends, attending museums, galleries, and pow-wows together. Seeing the work, my head automatically turned to look for George. To see the somber, intense expression brighten, and the dark eyes come alive. It was all there in the paintings. Image credits, from top: Phenomena Against the Crimson: Lake Superior Landscape, 1985, 9×12″, acrylic on canvas; Collections Fund Purchase; George Morrison, photo by Tom Attridge; Untitled (Lake Superior), 1986, 48×48″, acrylic on canvas; Ordway and Weyand Fund Purchase. All images courtesy Minnesota Museum of American Art. Decade anniversaries have a marked way of provoking both reflection and projection. Now in its 10th year, FLOW Northside arts crawl tried to do both: reflect on its past and move forward from it--beginning with their first ever artist talk. It centered on the question of what it means to be an artist working in the community, and specifically the Northside community. Taking place at Homewood Studios in North Minneapolis, the gathering drew some two-dozen artists and community members. One of the main goals, explained FLOW Artistic Director Dudley Voigt, was to provide an opportunity for established artists and emerging artists to be in the same space and learn from one another. “Particularly for visual artists as well as writers, for a lot of us, it can be very solitary work. And FLOW is very public, and yet it’s still solitary in the sense that the artists are spread out and they don’t get to see each others’ work.” Voigt and Homewood founder George Robert led the discussion, which included seven of FLOW’s 10 artists whose work was selected as a part of the organization’s 10-year anniversary postcard series.